This morning I opened the windows to a majestic sight. The days, indeed, are getting shorter. For so many months now I’ve opened the windows to find the sun shining bright. 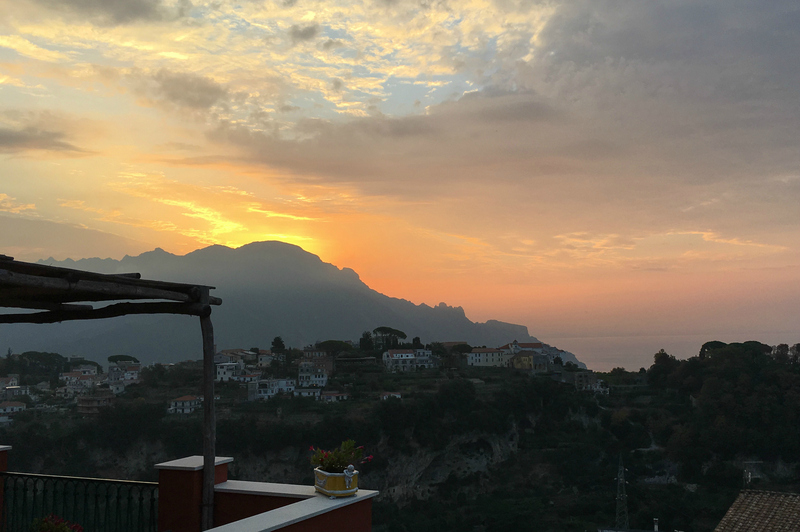 Today I caught the magic moment just before the sun appeared over the mountains, when the sky is aglow and everything is tinted with shades from deep orange to soft pink across the Amalfi Coast. Even when it doesn’t start so beautifully, September always makes me smile. This just felt like a gift. While it’s hot and summer still hangs heavy in the air, the first of September feels like a fresh start. And I look forward to it. Since moving to the Amalfi Coast, where August is the busiest month of the year, the beginning of September is something like a prize. I made it. There are still weeks ahead of enjoying the beach and summer weather with fewer crowds now, but those delicious first signs of autumn will also start showing up. I love the crunch of leaves, the smell of wine being made, persimmons and pomegranates showing up at the fruit shop and the colors of autumn. It also feels like the chance to make a new beginning. I’ve set my intentions and goals for September and am feeling energized. 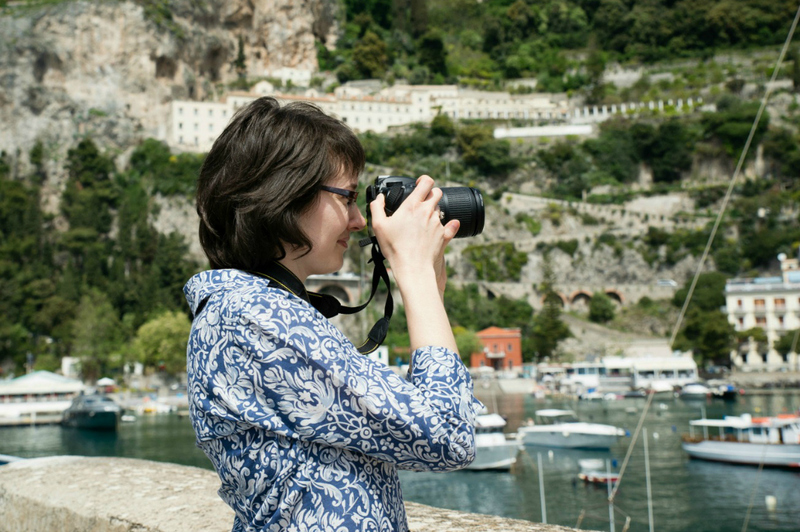 I have some fun plans coming up this month, and I look forward to sharing about them on Ciao Amalfi! I’ll miss September, but I am curious about what the weather etc. Will be like when I arrive October 1st for the month. So looking forward to it. Hi Holly! October is a lovely month, but the weather can be a bit more unpredictable. Two years ago I was still swimming in October (and I don’t like cold water) and last October was nice, too. Sometimes it can rain a bit more though. I hope it will be a lovely October this year! Laura, good to hear news again from the Amalfo Coast, your photo of the sunrise is beautiful. Last year we walked up to Pontone, a real gem with of course fantastic scenery, we walked on to Valle delle ferriere wow it was amazing. I saw the sign at Pontone to go up the steps for Scala this is where your photo was taken from isn’t it? I have promised myself that when on holiday this October we will make a point to go up to Scala, I remember some years ago we had a lovely lunch I think the restaurant was La Margherita, keep the news of Amalfi coming. Hi Gil! Yes this photo was taking from Scala – not too much further up than Pontone. You’d definitely love the hike from Scala down to Amalfi. It’s beautiful! I can’t imagine anything more beautiful to awaken to than this scene. I love your newsletter and blog. You keep me close to my favorite person and place in the world. Your photos always are so gorgeous and your writing is full of passion and enjoyment of your special place. I appreciate all you share. Thanks! Thanks, Mom! You know I would do anything to share as much as I can of this beautiful place with you. It is my joy! Thank so much for your lovely blog. It keeps me close to the Amalfi Coast while I save up for my next visit. I am coming with a friend for a week in Atrani 9/24. My question is does the Festa di Pesce in Positano last into the night? Could we just show up in the evening and participate or are tickets needed beforehand? Thank you for the help. Please keep sharing the loveliness that is Costiera Amalfitana. Ciao Susan, Thanks for your message! Yes the Festa del Pesce does go into the evening. You can definitely just show up and not have to book anything in advance. Have fun!